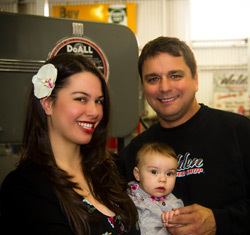 Melinda, Bobby and their lovely little future rodder. 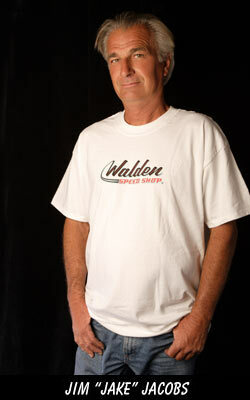 Called Walden's Speed Shop today and spoke with Melinda regarding the Buick adaptor hubs made by her husband, Bobby. You'd be hard-pressed to find a nicer person in the hobby. The hubs were in stock, but they were waiting for bearings. The hubs will be on their way here by middle of next week, which means all of the front end parts will be on hand to complete the front suspension using my big, aluminum Buick drums. So just days from now the front suspension will be able to support the weight of the drivetrain. Next, Mr T. will be moving on to the rear ladder bar suspension, using the parts we ordered from Pete and Jakes. Proving it really is a small world, Jake Jacobs, of Pete and Jakes firm, is a member of Walden's crew and has a line of parts under the Jitney by Jake moniker. One of which is an old school alternator bracket for small block Chevys that might come in handy once we're ready to get the engine accessories in place.